In this special episode, straight from the 2008 New York Anime Festival, I interview prolific voice actors Tony Oliver, Kyle Hebert, and Steve Blum. All three of them worked on Gurren Lagann (ADR Director, Kamina, and Leeron respectively), but they've also played characters from Robotech, Eureka Seven, Dragonball Z, Cowboy Bebop, The Big O, and even Toonami! On a more technical note, I'd like to extend a special expression of thanks to Kyle and Steve, since when the room we were in didn't have power (hence making my laptop useless), they used their iPhones to record the interview. The recording used in the podcast is from Kyle's phone, so you have him to thank for saving this interview. 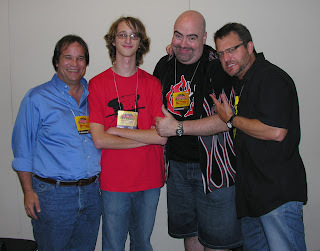 Okay, funny story: This post's picture (left to right: Tony, me, Kyle, Steve) was actually taken by voice actor Bill Rogers, who I only recognized AFTER I had asked him for the picture. Thanks Bill! As usual, show notes and supplementary links are after the break. [0:00:17] Quick little intro segment explaining the background info about the interview. Skippable if you read the description for the post. [0:01:13] Interview starts. I ask each of them about general things like if they're anime fans, how they got into voice acting, and what their favorite part has been about working on Gurren Lagann. [0:10:23] Now I begin asking specific questions for each actor, including stuff about script "purity" and changes in the industry with Tony, Dragonball Z acting with Kyle, and Toonami with Steve. [0:24:47] A couple more general questions before we finish up. These include favorite characters, preference for heroes or villains, and a request for some lines spoken in character.